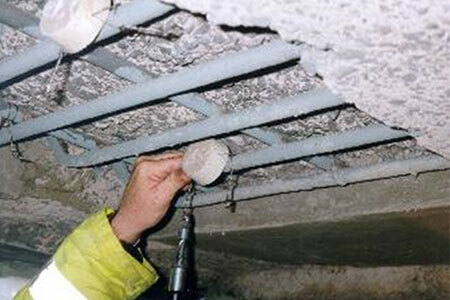 As outlined in our Car Park Refurbishment Services section of our website, the nature of the corrosion process of reinforcing steel when contained within concrete is such that conventional patch repairs – in other words, just repairing where there is a visible defect – inevitably introduces the ‘incipient anode’ effect. 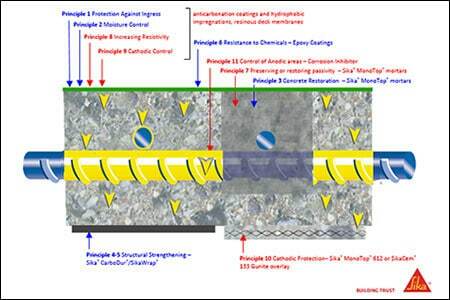 By this we mean that when you introduce a new, alkaline environment (the repair) adjacent to the existing environment (unrepaired) which may still be a less alkaline environment, this creates new potentials for corrosion all around the perimeter of the repaired area. A building’s façade is of course very different to a car park and is much less likely to have chloride-related problems in the same way as a car park does. Notwithstanding, buildings may still require a level of corrosion management dependant upon the causes of defects identified, differing reinforced concrete components (pre-cast v’s in-situ) or even the building’s proximity to the marine environment. The concrete repair process is such that only a comparatively small part or area of the concrete gets replaced which means large parts of the structure remain un-repaired. To control the spread of such processes such as incipient anode, there are measures that can be introduced termed as Corrosion Management. When repairing and protecting reinforced concrete, to effect the correct repair outcome with Car Park Refurbishment, the Corrosion Management process is a vitally important piece of the refurbishment jigsaw however client’s requirements vary accordingly with different outcomes. For example, some clients may have budgetary limitations and therefore look for a shorter-term repair strategy compared to a longer-term one. The effects of de-icing salts and carbonation on reinforced concrete has varying consequences of severity so it is vital to understand the causes of corrosion as part of planning a car park’s repair & protection strategy. There are multiple ‘ingredients’ within the corrosion process (water, oxygen, salt chlorides etc) which when combined, can start the corrosion process.